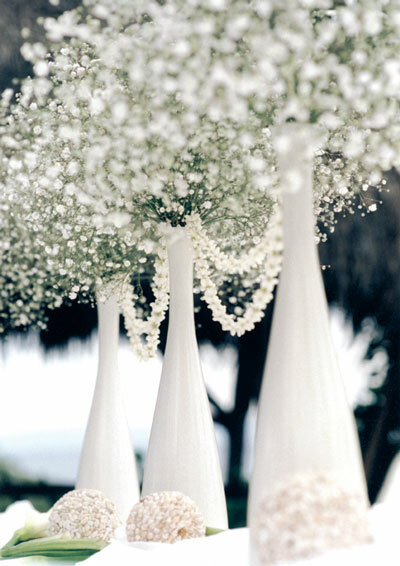 Winter weddings are a wonderful opportunity to let your creative juices flow. With so many seasonal favourites at your fingertips, coming up with the perfect winter wedding centerpiece is really easy. Examples? 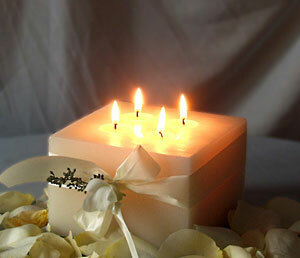 Candles bring warmth and elegance to any space and using them at a winter wedding really creates this atmosphere. Large or small candles in random arrangements at the table's centre are practical, easy, affordable and very effective. Candles are available in all shapes and sizes and can be combined with vases or bowls to create a variety of moods. Floating candles or candles in hurricane vases are both excellent centerpiece choices as are pillar candles in graduating sizes. Small ornamental trees or plants that are cut and shaped into a small decorative piece of "table art" are an excellent choice for a winter wedding. They offer a modern and unique look to your décor. Use topiaries in rich colours against a white table setting for contrast and drama. Is your wedding near the Christmas holidays? 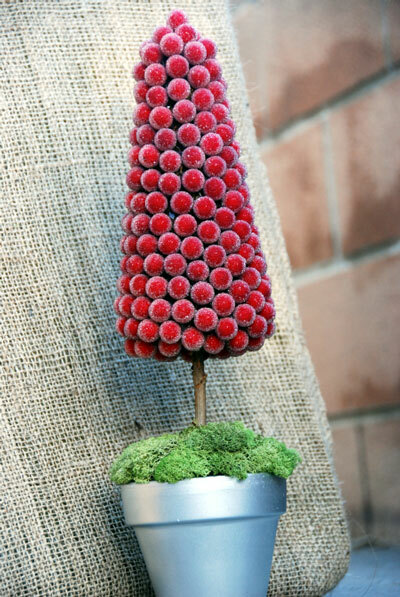 A miniature faux Christmas tree would be very appropriate for a centerpiece. If Christmas isn't your thing, trees are still a good centerpiece idea simply replace the Christmas tree theme with a mirrored mini tree or a pre lit white mini tree. 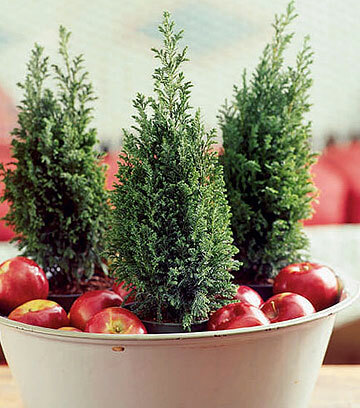 Or, you could even use a series of mini trees (no décor on them) in graduating sizes. Florals Flowers are always a great centerpiece choice regardless of season. When choosing flowers for your winter wedding however, remember to look for flowers that are actually readily available in the winter in order to keep costs down. 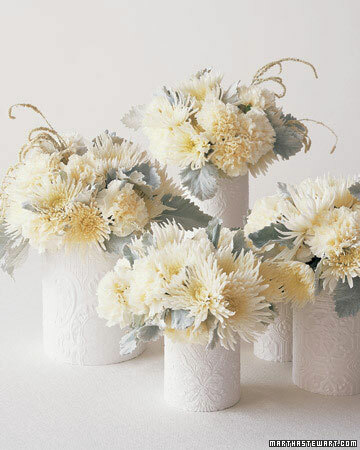 If your wedding theme is "winter", choose white or pale blue florals in silver vases. 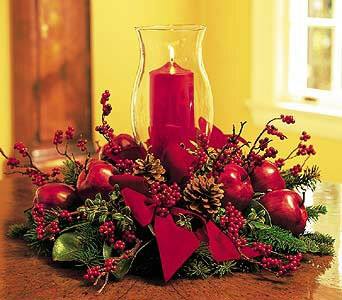 If your theme is "holiday" or "Christmas", make sure to include berries, pine cones and red blooms in your arrangements. 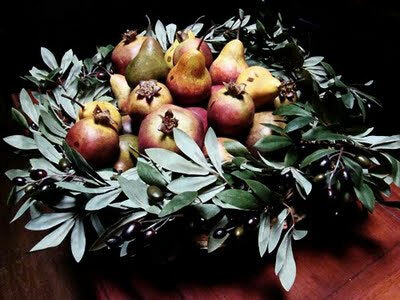 Real or artificial fruit is an excellent choice for a winter wedding centerpiece. As winter fruit is full of rich, bold colours, placing them in decorative vases on the tables will instantly add drama to your table. Cranberries, apples, pears and pomegranates are all excellent seasonal choices. Pine cones and berry sprigs add nature and seasonal "spice" to any winter table décor. These natural delights bring colour and warmth to the décor and are definitely synonymous with winter. Arrange a few plain or painted pine cones on your table for an easy yet very seasonal centerpiece idea. Gingerbread houses are perfect in any winter décor. They add colour and aroma to the table. 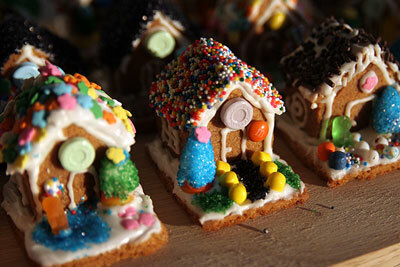 Choose a variety of gingerbread houses so that each table has its own "style". You may even have the table number incorporated into the house design so that you don't have to add table numbers on the table as well. Have a contest during the night where one guest per table can win the gingerbread house. 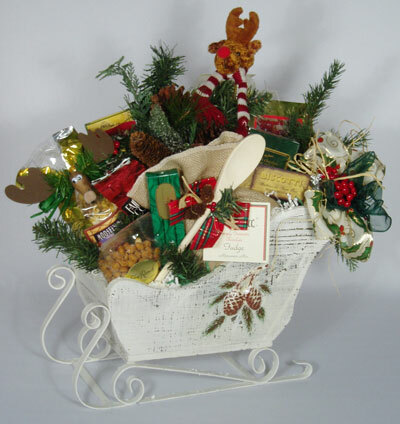 Baskets full of winter treats are a good choice because they can be quite big, creating a nice full look on the table but they can also be beautifully decorated with ribbons and flowers to make them really stand out. Fill them with candy, fruit, or other treats that your guests can munch on throughout the night. 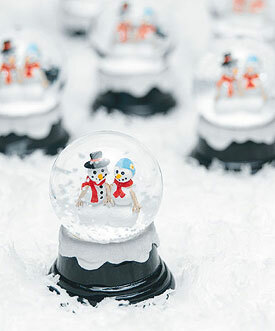 Elevated snow globes are a fun yet practical choice for a winter centerpiece. Everyone loves playing with them, they will look great on the table (especially with some ribbon around them) and they make a great take home gift for one lucky guest. Better yet, by a bunch of miniature snow globes, arrange them on the table with pretty ribbons around each one, then have each guest take one home as a wedding favour. Winter Whimsy! 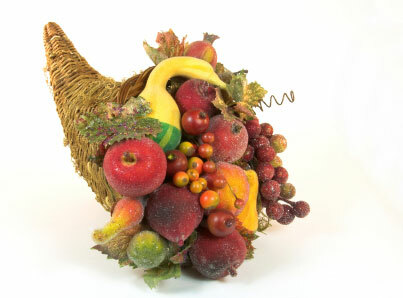 This is where you can let your proverbial hair down and really have some fun with this centerpiece project. You can have a different centerpiece on each table or the same throughout.. Examples? Create a different theme for each table and create a centerpiece for it. For example, if someone is sitting at the "North Pole" table, their centerpiece might include a reindeer and some presents.